1. Boil the spinach in sufficient amount of water for about 2 to 3 minutes, drain the whole water and grind the spinach to make a smooth paste. 2. Add wheat flour, salt, curd, green chillies, ginger-garlic paste, cumin powder and garam masala powder to palak paste. 3. Add ghee and mix very well. 4. Mix all the ingredients very well and add some water to make a tough and smooth dough. 5. Cover the dough with muslin cloth and keep aside for 15-20 minutes. 6. Knead the dough again just for a minute and divide into equal sized portions or balls. 7. Roll out each ball by dusting some flour or oil with a rolling pin. 8. Heat enough oil in a pan and fry each of the puris from both sides until turns into nice, golden and crisp. 9. Serve the piping hot palak puri with any dry dish, curd and roasted papad. 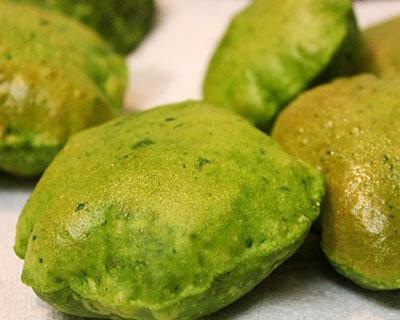 Tips: It is very important that the dough is firm and tight & not too watery to make proper palak puri, else it will be difficult to roll out puris. Fry one puri at a time in hot oil and stir well to avoid the dark color or puri. 1. Wash the basmati rice gently changing water several times until the water appears clear. 2. 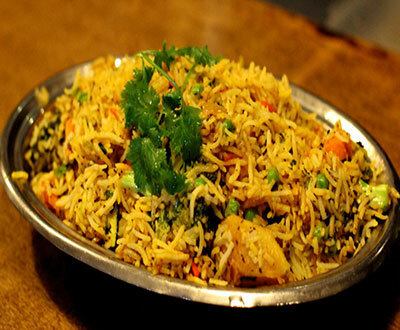 Keep the basmati rice soaked for 10 mins prior to cooking and drain water. 3. Cut all vegetables lengthwise. Chop tomatoes. 4. Add all the vegetables to the yogurt. Mix it well then let it marinate for 10 to 15 minutes. 5. Hheat oil in kadai or cooker pan , add curry leaves, onions and fry till brown. 7. Add the marinated vegetables, rice, chilli powder, everest masala, salt , water and close the pressure cooker lid. Allow for one whistle and in medium flame and switch off once done. 8. After cooling, open the lid, mix once and sprinkle corriander leaves. Serves: 4. Serve with onion cucumber or onion tomato raita. 1. Chop or break the gobi/cauliflower in medium size florets. Boil the florettes with salt for 3-4 minutes in plenty of water, to which a tbsp. of milk has been added. 2. Drain and pat dry on a clean cloth. Ina bowl mix flour and 2 tbsp. cornflour, adding 1/4 tsp. each of ginger and garlic and red chilli powder and salt to taste. Add water and form a smooth batter. 3. Dip the florettes in the batter one by one and deep fry in hot oil. While frying the florets start to stick to each other due to the cornflour. so as soon as you add the florets, keep on lightly stirring the frying spoon between the cauliflower florets so that they don't stick to each other. 5. In the remaining oil, add remaining ginger, garlic and crushed red chilli and fry for a minute. Add the salt and spring onions. Stir fry for a minute. 6. Add veg stock or water and bring to a boil. Add 1 tbsp. cornflour to 1/4 cup water and dissolve well. Gradually add to the gravy and stir continuously till it resumes boiling. Boil till the gravy becomes transparent. Add florettes and soya sauce. Boil for two more minutes and remove. Serve hot with noodles or rice. 7. 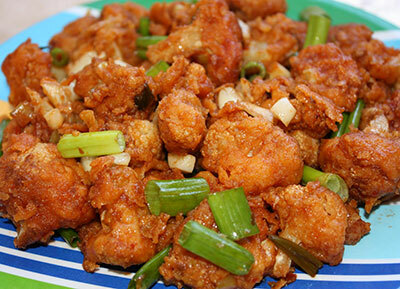 Dry manchurian can be made by omitting the gravy. Make florettes as above and instead of adding water as above, add fried florettes, spring onions and soya ce at this stage. 8. Sprinkle 1 tsp. cornflour on the florettes and stirfry for 2 minutes. Serve piping hot with toothpicks or miniforks and chilligarlic sauce or tomato sauce. Same procedure for veg. manchurian (with gravy or dry), but instead of using only cauliflower, use finely chopped minced vegetables and bind with some cornflour or bread crumbs and make small lumps the size of a pingpong ball. Fry as above and proceed as above. 1. Cut the potatoes into small chunks. Wash it well and drain the water and slightly mash them. Keep it aside. 2. Blend all the ingredients of puree to form a smooth paste, keep it aside. 3. Heat oil over medium heat in a non stick pan and add cumin seeds. 4. Allow spluttering and then add turmeric powder, red chili powder, salt and wait for 10 seconds. 5. Now mix the puree and saute and cook for 2-3 minutes until the raw smell is gone and oil appears on the sides of the pan. 6. Add potatoes and 2 cups of water. 7. Simmer it for about 15 minutes. 8. 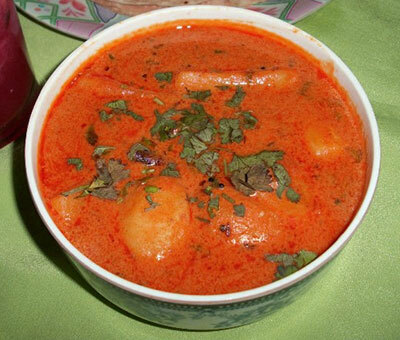 Aloo curry is ready to serve with rice, roti or puri. 1. 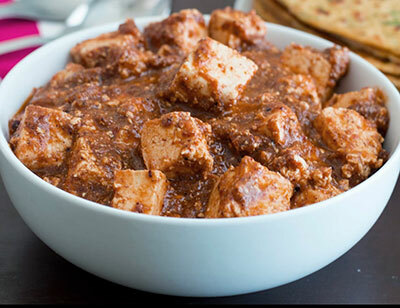 Slice paneer into nice square pieces. 2. 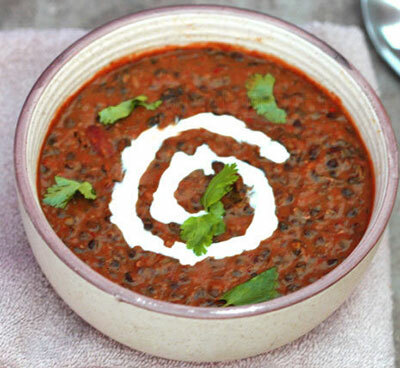 Put saunf, mustard seeds, methi dana, kalonji and jeera into a bowl. 3. Grind garlic and ginger roughly and keep aside. 4. Heat the oil and add the mixture of seeds together into the heated oil. Let them splutter for 1 minute. 5. Then add chopped green chillies and onions. Fry till onions turn golden brown. 6. In this add, haldi and the garlic-ginger paste and cook for 1/2 minute. Add the paneer pieces. 7. Bring the curd to a smooth texture by stirring with a spoon and add gradually and keep stirring. 8. Add 1/2 tsp salt and amchoor powder. Dry up the curd a little bycooking.